Those were some of the first words Tony Colacchio ever said to Steve Emt. Colacchio, a wheelchair curling instructor, had seen Emt effortlessly rolling himself up a hill in Woods Hole, and then spent 45 minutes walking around trying to locate him. It was 2012, and the 48-year-old Emt was visiting the cape from Hebron, Connecticut. He wasn’t sure if Colacchio was serious, but the former University of Connecticut basketball player was intrigued. It’s a question many people would ask, as awareness of the quirky sport tends to peak every four years during the Winter Olympics but then fades away soon after. During this year’s Olympic Games in Pyeongchang, South Korea, the sport has won over celebrities, including Mr. T, while curling fans gave Kirstie Alley a piece of their mind after she tweeted that the sport was “boring.” Most notably, the United States’ men’s curling team shocked everyone when they won a gold medal for the first time ever. After becoming paralyzed following a car accident in 1995, Emt tried wheelchair basketball and wheelchair tennis, and raced in the New York Marathon in 2010. He was looking for a sport that he could fall in love with, so when Colacchio approached him outside Pie in the Sky bakery that day, it seemed fated. It took five years, not one, but Colacchio made good on his promise — Emt is a member of the 2018 US Paralympic wheelchair curling team (Colacchio is the associate national coach). Of course, it was Emt who put the effort into a sport that was a natural fit for him, training at the Cape Cod Curling Club with Colacchio and closer to home at the Norfolk Curling Club in Connecticut. “It’s a very cerebral game,” says Emt, who also works as a seventh-grade math teacher. Many refer to the sport as “chess on ice” because of the level of strategy involved. Meghan Lino, Emt’s Paralympic teammate, says that strategy drew her to the game too. “You see it on TV and you’re like, ‘Oh they’re just throwing rocks,’ but that’s not it at all,” Lino says. “You have so much strategy, whether you’re trying to get points or you’re ahead and you’re trying to prevent the other team from getting points.” The 33-year-old from East Falmouth says she never considered herself an athlete before she started curling in 2008, after attending a charity event with a friend at the Cape Cod Curling Club. It was there that she met Colacchio. “If you are willing to put the time and effort in, I’ll help you practice and train, and I’ll make you into a Paralympian,” she says he told her. Like Emt, Lino was skeptical. “I was like, ‘I don’t know about that, but let’s go, let’s try it.” Again, Colacchio was true to his word. In addition to competing in Pyeongchang, South Korea, this month, Lino was a member of the 2014 Paralympic wheelchair curling team in Sochi, Russia. The team came in fifth. Curling gets its name from the way the 42-pound stones move as they slide across the sheet, which is what the playing surface is called. The surface of curling ice is prepared by spraying droplets of hot water onto the sheet, which quickly freeze and create pebbles, little raised dots that cover the ice. The pebbled sheet allows the stone to more easily glide on the ice, but it is also responsible for creating patterns that affect how the stones move across the surface. The textured surface creates a surprising sensation when you drag a stone along the ice; where instinct and visual cues would indicate that objects glide smoothly, the stone instead feels more like a car driving on a dirt road. It rumbles. The rules generally follow that teams of two or four athletes take turns throwing the curling stone. The objective is to get your team’s stone closest to the button, which is essentially the center of a bullseye. Each game consists of eight ends, which are like innings in baseball, and each player throws two stones per end. Only one team will score per end. Curling has only been a Paralympic event since 2006, and the wheelchair version of the sport doesn’t have sweepers at all. Also absent is the kneeling slide and release that able-bodied players use. Instead, players use a delivery stick — a pole that fits over the handle of the stone — to release the stone from a stationary position. A teammate sits directly behind the player throwing the stone to hold their wheelchair in place and prevent it from sliding backwards. 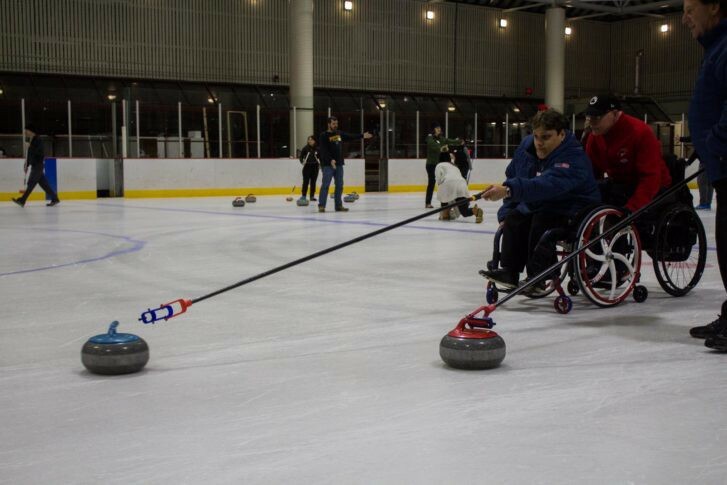 Because sweepers can help stones travel farther and help steer the direction of the stone, the absence of this position in wheelchair curling means that the players have to be more accurate with their shots. The other big difference is that, while able-bodied curling has men’s, women’s, and mixed doubles, wheelchair curling teams are always mixed gender. Despite the fact that not a lot of people in the US seem to know much about curling, there are at least nine curling clubs around Mass. They include the previously mentioned Cape Cod Curling Club in Falmouth, the South Shore Curling Club in Bridgewater, the North End Curling Club in Boston, Broomstones Curling Club in Wayland, Blackstone Valley Curling Club in Hopedale, Marlborough Curling Club, the Petersham Curling Club, and Curling Club of the Berkshires in Lenox Dale. There’s even one on Nantucket. But all this interest is relatively recent. Five of the clubs were formed in 2016 or 2017. The game of curling as we know it today was developed by the Scots sometime in the 17th century. By the mid-1800s, the rules of play had been formalized at the Royal Caledonian Curling Club, known as the “mother club” to curlers around the world. The game was originally played outside on natural ice, but thanks to climate change, the warming climate means that Scotland’s lochs rarely freeze any longer. 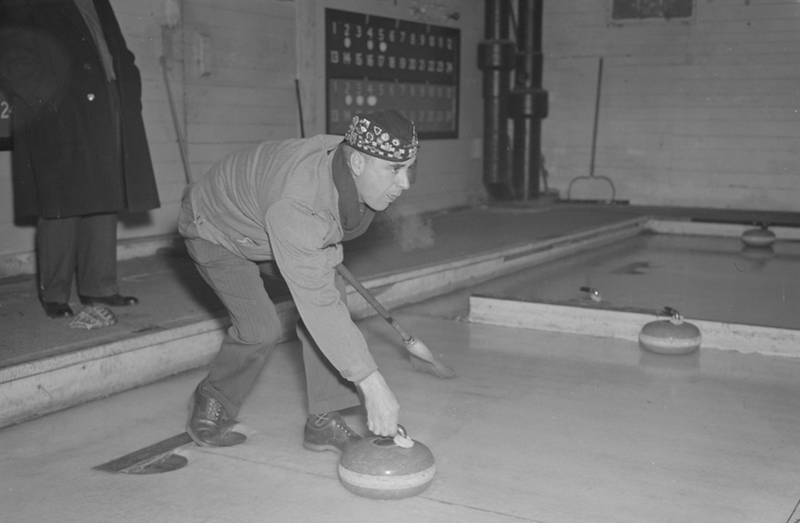 Records of Boston-area curling matches date back to 1835. The outdoor ponds in the Boston Public Garden, Spot Pond, Fresh Pond, Chandler’s Pond, and Franklin Field all hosted regular curling matches when the bodies of water had frozen over. The game’s early players faced harsh conditions. 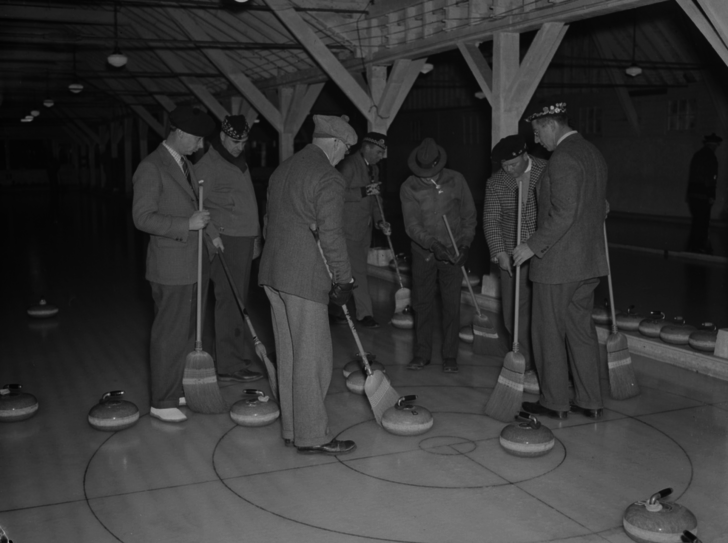 It was Boston that introduced a massive change to the sport of curling on Jan 18, 1911. At the old Boston Arena on St. Botolph Street, a curling match was played on artificial ice that had been made and prepared just for curling for the first time in the world. After the arena burned in 1918, a dedicated curling facility was built two years later, and it is considered the first of its kind, writes Cappers. The Country Club in Brookline played a major role in helping foster interest in curling in the US. Women came later to the game, as the harsh outdoor conditions it was played in were often considered too rugged for women. Women’s curling in Boston grabbed a foothold in 1937, almost 40 years after the sport first gained interest in the region. Switzerland and Sweden spearheaded the game of wheelchair curling, first introducing it to the world at the 2000 World Handi Ski Championship in Crans Montana, Switzerland. According to the World Curling Federation, the sport is now played in 25 countries. 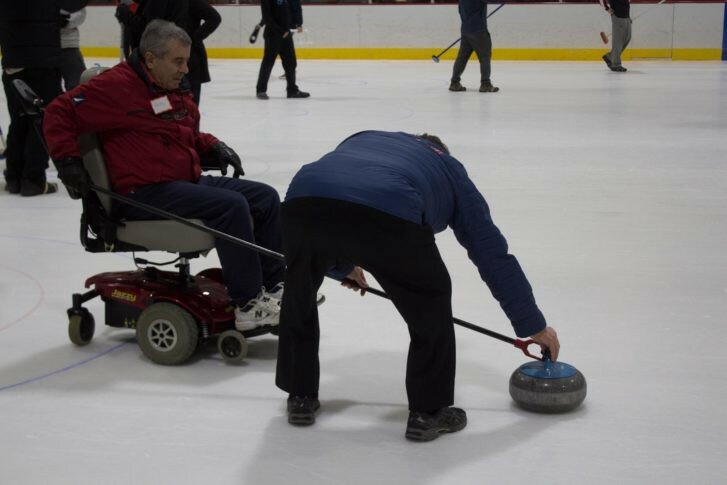 In Massachusetts, some of the older clubs — including the largest in the state, Broomstones Curling Club, founded in 1968 — cannot accommodate wheelchair users. But in many of the newer clubs, wheelchair users play alongside able-bodied players in leagues. 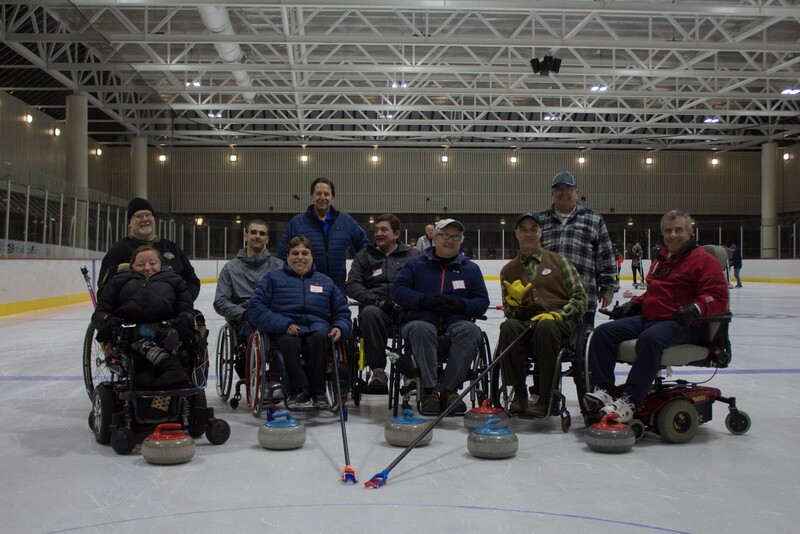 Marlborough Curling Club, Blackstone Valley Curling Club, and Curling Club of the Berkshires are all accessible and welcome new participants who may have an interest in wheelchair curling. In Steriti Memorial Rink in the North End, people in the frigid arena can be heard enthusiastically yelling, “Sweep! Sweep!” Approximately 30 people, many intrigued by the fringe sport they’ve been watching on TV at the 2018 Winter Olympics in Pyeongchang, have come to try it for themselves. The late-February event’s title is self-explanatory: Learn to Curl. In the corner of the rink, Colacchio is speaking to a group of wheelchair users who have circled up for his PowerPoint presentation. He’s printed slides — 32 in all — for everyone and is going into serious detail about the sport they are about to play. Colacchio is wearing a navy blue down jacket with the letters “USA” emblazoned in red on the back; Lino wears a matching one. Her wheelchair is red, white, and blue with the words “Team USA” on the spokes. Colacchio tells the group that the two are heading to Pyeongchang early the next morning. “Wheelchair curling is in its infancy, but it’s growing,” Colacchio tells the seven eager attendees. “To get a group this size five years ago would never have happened.” He estimates that there are only 50 to 60 wheelchair curlers in the country, so to see this group plus the four athletes he’s brought to help him with instruction is a big deal. With that, they’re ready to give it a try. The event is hosted by the North End Curling Club, which formed in November 2017. Paul Aronofsky, vice president of the NECC, says that as soon as they found out Steriti Rink was accessible, there was no question that they were going to have an event for wheelchair users. He’d seen the sport played at Blackstone Valley Curling Club. “It’s something a lot of people don’t really know exists or don’t know [is] an option, so I really wanted to do something in the Boston area to provide that experience for people,” he says. 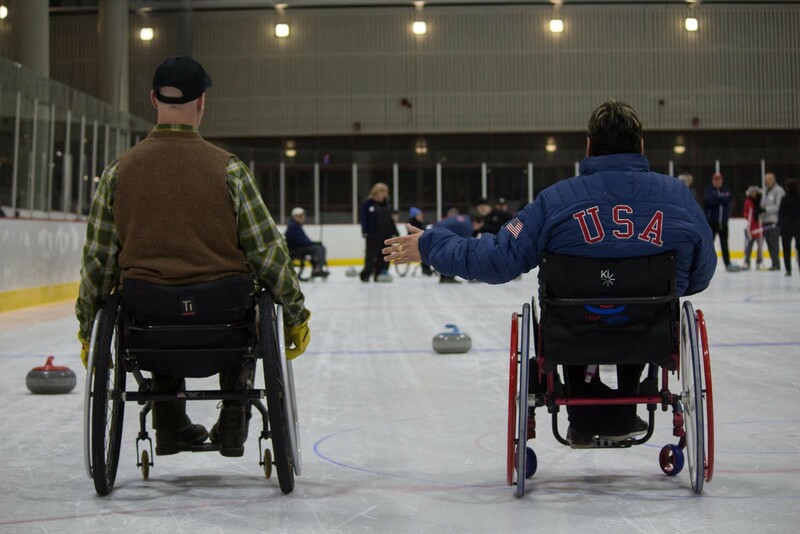 Paul Sousa drove up from Brockton with his wife, Jane, to learn how to wheelchair curl. Jane is a member of two curling clubs, the South Shore Curling Club and Broomstones. It’s a hobby that takes up most of her time. “I never see her,” Paul laughs. He says he wants to be able to share the game with Jane, but the South Shore club doesn’t have any other members who use chairs, and the thought of being alone on the ice is intimidating. The Sousas had driven to the cape last year to watch a wheelchair curling bonspiel (tournament), where they met Colacchio. So when they heard he’d be in Boston with Lino hosting an accessible Learn to Curl, the couple made the trip. Over the course of the two hours he spends on the ice, Paul’s feel for the stick and release get better and he makes several impressive shots. By the end of the night, he jokes that he’ll now be able to beat his wife at her own game. His eyes are bright, sparkling with a new enthusiasm for the game. It’s clear that the accessible event is filling several gaps. One participant drove three hours from Vermont to attend, while another, Ed Clark, came down from Windham, New Hampshire. “I’ve always wanted to try curling but haven’t had the opportunity,” Clark says. He’s no stranger to sports on ice — Clark was a member of the 1998 US Paralympic Sledge Hockey team that competed in Nagano, Japan. Colacchio, always in recruitment mode, perks up at this piece of information. f you would like to see more reporting like this, you can support nonprofit media at givetobinj.org. Originally published at digboston.com on March 8, 2018.